Age Concern Epsom & Ewell is a local independent charity established in 1947 to empower older people in the Borough of Epsom & Ewell to live the most fulfilling lives they can. As well as providing a free and confidential Information and Advice Service, we also run a number of other services from transport to befrienders; none of which would be possible without our team of wonderful volunteers. Please come to our second concert in collaboration with Surrey Brass, to enjoy great music, a friendly social atmosphere and of course our soon-to-be-legendary Gin Bar at the interval! Brass Explosion is part of the exciting new Household Division Music History and Arts Festival. This all day event and evening concert features two brass ensembles, one military, one civilian. Surrey Brass and The Guards Brass Ensemble join forces to present the best music of the genre. The concert celebrates two historic milestones - 15 years of Surrey Brass, and 100 years of massed bands of the Foot Guards. The setting of the Guards Chapel provides a perfect back drop with hundreds of years of heritage and history lining the walls. The ‘laid up’ Colours of our forefathers hang bears testament to both the past and present custodians of State and Ceremonial music making. The day starts with an open rehearsal which will preview some of the music for the evening concert as well as other repertoire. On show will be rehearsal technique, musicianship, together with great tips on both individual instrumental and ensemble playing. The rehearsal will give everyone unparalleled insight into the daily life of a brass musician, and provide a range of practical advice and ideas about how to play better and deliver great performances. The rehearsal will be directed by Adam Rapa, who will be providing insight into brass playing at the very highest standard throughout. In the afternoon, the masterclass will feature a number of players - maybe you? - in a workshop format that will exercise different styles of playing including classical and jazz. Simply watching many one-to-one tutorials with the participants will deliver one of the finest free brass lessons one could ever have - well worth attending. If you are a budding soloist or section leader this session is a must. It will showcase a wide variety of music at a very high standard. If you are interested in participating you can Register to perform. It's completely free! In the gaps between sessions during the day, everyone is welcome to include a visit to The Guards Museum between 10:00am to 4:00pm. The museum contains a wealth of information and artefacts relating to the five regiments of Foot Guards (Grenadier, Coldstream, Scots, Irish and Welsh Guards). Along with the two regiments of Household Cavalry they make up Her Majesty’s Household Division and enjoy the treasured privilege of guarding The Sovereign and the Royal Palaces. The evening concert programme contains a combination of original music and arrangements from many musical styles including original and arranged classical music, light music, film music, and jazz and features renowned guest soloist Adam Rapa. See below for more on the programme. A special feature of the concert is a performance of "Song of Hope" by Peter Meechan. 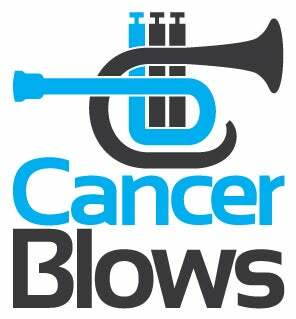 "Song of Hope" is dedicated to Ryan Anthony (principal trumpet with the Dallas Symphony Orchestra) and his charity, Cancer Blows raises both awareness and money to encourage research for cancers with a focus on blood cancers & multiple myeloma. Feel free to donate to this worthy cause! This all-day brass event is free to all. Everyone is welcome to any or all of the sessions. The 7pm Evening Concert features a spectacular blend of music from Surrey Brass, Guard Brass, and Soloists - click on the links to preview the some of music. The programme is continually evolving, so please visit again for an update, and if you wish to be notified automatically why not Join Our Mailing List? Surrey Brass is 15 in 2017 and you can read about us here. To mark this auspicious occasion we are celebrating by playing some of the innovative and entertaining music projects we have commissioned since our formation, throughout our concerts this year. The Guards Brass Ensemble was formed in late 2015 from brass players from around the Household Division Bands, with the sole intention of performing in the Guards Chapel Recital Series. Since then, the group has performed in scores of concerts with musical excellence and community engagement at the very heart of everything they undertake. Read the full biography of The Guards Brass Ensemble. You can hear The Guards Brass Ensemble rehearsing here. Tickets are FREE with a retiring collection. Festival Information is available from The Chapel Office 02074143229 during office hours. Green Park, Waterloo, Charing Cross and Victoria Underground stations are also within walking distance. Car parking is not available on site. In a hugely varied and enormously fun show featuring (no less!) a pop duo, an opera singer, a musical comedian, a pianist and singer, Surrey Brass and more, each will provide around 20 minutes of entertainment for this worthy cause. This show, organised by local actor and retired policeman Bob Ferris, raised over £2700 last year in a local village hall and inspired by this success he has made this year's event twice as large, and would like to raise four times as much money. All performers are providing their services completely free of charge to support this fundraising effort. Come along, enjoy the show and help us raise money for a hugely worthwhile cause. Supporting Friends of The Royal Marsden, Surrey, and Tenovus. If you want to be reminded about this concert nearer the date, please join our mailing list. You can unsubscribe at any time.